We have crafted fine men's shirts since 1928. Our original factory and headquarters remain in Gånghester, Sweden, where our very first shirts were sewn. Evolving from Swedish craftsmanship and attention to detail, Eton is today a global leading shirt maker and can be found in 49 markets at some of the world's most exclusive stores. All our shirt fabrics are made from scratch to guarantee the high performance that characterizes our shirts. The garments are long-lasting and should inspire to care for them in the best way possible. We constantly renew ourselves. Working close with our suppliers enables us to innovate fine shirting and create unique shirts and accessories. We create diverse and versatile shirts for any occasion in life. From business and formal events to your day off – there’s always an Eton shirt to look good in. We believe that sustainability equals high quality. Read more about our view on sustainability. In many ways, the story of Eton is the story of its founders, David and Annie Pettersson. In the early years of their marriage, Annie begins sewing dresses from their kitchen for family and neighbours. When the Depression hits in the 1920s, however, David is forced to close the family’s sawmill. This leads to him joining his wife, whose business, by contrast, is growing quickly. Together, the two launch Syfabriken Special (Swedish for “The Special Sewing Factory”) and opt to place their primary attention on the creation of men’s shirts, which soon became popular among the locals. As Rune and Arne Davidson (the sons Annie and David) begin traveling around the world in search of new fabrics that are well-suited for fine shirts. Their travels inevitably lead them to England, which has long been a global leader in fine fabrics. On one such excursion, the two pass through the small town of Eton – a name that carries a strong allure for the brothers. Together, they carry home a new garment and soon, “The Eton Shirt” is released. Skjortfabriken Special is so well-known for the Eton shirt that the company adopts “Eton” as its new name. With increased demand nearly bursting the seams of the company’s factory, finding a larger location becomes imperative. Aiming to stay at home in Gånghester, the brand designs and begins work on a new, highly modern factory. Leaning heavily on Inge’s (son of Eton funders Annie and David) innovative technology – which he later develops into an own company, Eton Systems – the new space is a marvel, setting the tone for many years of superior shirt production.  While Eton has become recognised for its high-quality garments, the company still struggles to communicate its message to the right retailers. To combat this problem, Eton hires a new sales team, including Rune Hallgren. Despite barely speaking English, Hallgren secures a meeting with a small British clothing shop. After reviewing the superior craftsmanship of Eton’s garments, the owner makes a small order. Soon, the first success abroad is set. The factory’s process of transporting and storing Eton’s garments is far too inefficient for the company’s intended volume. Inge Davidson (son of Eton founders David and Annie) – who spent much of his childhood tinkering with sewing machines – sets out to create a fix. The result is an automated transport line which carries pieces from each stage of development, thus making the planning, storage and quality control of shirt production far more economical. This new innovation would not only help Eton survive growing competition from newly industrialised countries, but would also revolutionise the entire clothing industry. Eton presents Eton Etastar, the world’s debut crease-resistant shirt in 100% cotton. The first retailer carrying the product is none other than Harrods, who sells an astounding volume of roughly 600 shirts in the first week alone. To boost the release even more, Eton’s designer Jan Borghardt convinces the department store to implement its first-ever promotional campaign. This campaign creates echoes all over the world, and Eton quickly becomes Harrods’ best selling shirt. Eton opens a flagship store in the centre of Manhattan’s Upper East Side. Inhabiting a two-storey venue, this New York location houses the full Eton collection, as well as a showroom and VIP area for guests. In the up-coming three years we will open new flagship stores in London, Stockholm and our own E-commerce. This year is a new chapter for Eton, where the story becomes clearer and more diverse. We reveal a new identity with updated logo and labelling, as well as new interior design and changes in our collections. Red Ribbon is renamed to Eton Collection, Green Ribbon to Eton Green and Black Ribbon to Evening. We also introduce a new collection of stylish shirts for all relaxed occasions – Unbuttoned.